Sunday's "This Week" panel, in partnership with the University of Virginia's Miller Center, tackles the question "Is the U.S. Headed Toward Bankruptcy?" TAPPER (voice-over): Good morning. Welcome to "This Week." OBAMA: You can't drive a car with a windmill on it. I mean, maybe he's tried it. He's put other things on the roof. ROMNEY: He's intellectually exhausted, out of ideas and out of energy. TAPPER: A vicious week with some tough accusations. BIDEN: Look at their budget and what they're proposing. They're going to put you all back in chains. (UNKNOWN): If I had one piece of advice for this administration, shut the (bleep) up. TAPPER: So, the big questions: Why are the candidates and campaigns going for the jugular? Will they pay a price? And will the country? And if this is what it's like in August, what are we in for come October? We'll ask our headliners, for the Romney campaign, senior adviser Kevin Madden, and Obama deputy campaign manager Stephanie Cutter. Then, how can we get the nation's finances under control? Is Paul Ryan's budget the answer? Is the U.S. headed towards bankruptcy? We'll ask our all-star panel of experts, along with our partners at the University of Virginia's Miller Center. TAPPER: Good morning, everyone. George Stephanopoulos has the morning off. After Mitt Romney's selection of Paul Ryan as his running mate last weekend, there was a brief moment where it looked as though the tone of this increasingly tough campaign might be elevated with a complete focus on critical issues, such as fixing the nation's finances. That lasted about a day or two. Now the attacks are back with each side blaming the other, so let's begin right there. Joining us now is Obama deputy campaign manager Stephanie Cutter and Romney senior adviser Kevin Madden. Stephanie and Kevin, thanks so much for joining us. MADDEN: Great to be with you. TAPPER: So, Kevin, let me start right with you. The race did not let up this weekend. Here is President Obama in battleground state New Hampshire. He -- he put forward a plan that would let Governor Romney pay less than 1 percent in taxes each year. Now -- and here's the kicker. He expects you to pick up the tab. TAPPER: Now, Kevin, I know that Governor Romney does not support reducing his 13.5 percent tax rate to less than 1 percent. But on its face, that statement is correct. Congressman Ryan did propose eliminating all capital gains taxes, which would mean a less than 1 percent tax rate for Governor Romney, right? MADDEN: Well, no. I think Governor Romney and Congressman Ryan are running on a shared vision, shared principles, and shared ideals, as it relates to tax reform, and the tax reform that Governor Romney is proposing would be much broader. It would -- it would actually lower the rates for middle-class Americans. It would actually incentivize middle-class Americans to save more and invest more by reducing their capital gains and dividends down to zero under $250,000 a year, and then ultimately help broaden the base of the tax -- help broaden the tax base by also reforming the corporate rate. Look, this is a -- a campaign that's very focused on the middle class. Governor Romney has made -- made very clear that what he's doing is putting forth an economic vision, an economic plan, along with Congressman Ryan, that's focused on helping the middle class, so that we have more jobs and more take-home pay. And that's the focus. CUTTER: Well, you know, I find that statement slightly incredulous, because the tax plan that is on the table -- even if Congressman Ryan is now agreeing with Mitt Romney on his tax plan -- it's a $5 trillion tax cut, mostly geared toward the wealthy, that independent analysts have said in order to pay for it, they're going to have to increase taxes on the middle class. For middle-class families, middle-class taxpayers with families, that is on average about $2,000 more for -- for taxpayers. So if this is a campaign about the middle class, then they need to be honest with the middle class about what's ahead of them with that tax plan. And, you know, Jake, I agree that the central question in this campaign is how we're going to strength the middle class. We've got plans on the table to do that. You know, just after Congressman Ryan was picked, he said that they were going to hold back on putting any details on the table until after the election, and Romney advisers were saying it would be political suicide to talk about those details. So we'd like to have a substantive debate about, you know, the central question on the table about how to strengthen the middle class, but to do that, they're going to have to tell us what their plans are. MADDEN: Well, just real quickly, though, Stephanie, on that, I mean, the president's main tax proposal would be a tax hike on millions of small businesses. Now you know that -- that that tax on millions of small businesses is going to hurt the job-creators, it's going to hurt so many people across the country, and it's not going to be -- it's not going to do what we need to do in this economy right now, which is create more jobs and provide more incentives for people to hire. TAPPER: Stephanie, you can have the last word on this. Go ahead. CUTTER: OK. I'm not sure what you're talking about, but I think you're talking about the extension of the Bush tax cut for upper-income Americans. We all know that it has nothing to do with small-business growth. Ninety-seven percent -- or 98 percent of small businesses are below $250,000. And if that tax cut for the wealthy was so important to growth, then why did we retract as an economy under the Bush administration? We had the lowest growth in the century under the Bush administration with those tax cuts, so those facts just don't hold up. TAPPER: OK, let me -- let me just change subjects for one second. Stephanie, you heard in the open Governor Romney this week saying that President Obama's conduct is unbecoming of the presidency. One of the items that the Romney team specifically objects to is that this week there was one day in Iowa when President Obama made three references to Governor Romney in 1983 putting his dog in a kennel on the roof of his car. Is this one of the big policy debates that the Obama campaign wants to have, whether or not it was appropriate for Governor Romney to put his dog on the top of a car in 1983? CUTTER: Well, I'll leave it for others to decide whether it was appropriate, but, you know, it was a light-handed remark. What you didn't cover is what the president was actually saying in Iowa. You know, on Monday, he talked about the historic drought facing Iowa farmers and what we needed to do about it. We needed Congress to pass the farm bill so they could get the aid that they needed. On Tuesday, he talked about the enormous impact clean energy is having on creating jobs in Iowa, thousands of jobs from the wind energy tax credit, the wind energy tax credit that Mitt Romney doesn't want to extend, which would mean the loss of many, many jobs on the ground in Iowa. So that's what the president was actually saying; that's what Iowa voters heard. So the president is out there every single day talking about where he wants to take this country. Just yesterday in New Hampshire, he absolutely contrasted his plan for Medicare with Mitt Romney and Paul Ryan's plan for Medicare. But that's the central question on the table for this election, how we're going to strengthen Medicare, whether we're going to protect seniors or we're going to shift all the costs to seniors. So, you know, we're happy to have a substantive debate, but we need some substance on the other side. MADDEN: I mean, you know, if I could just respond to that, Jake, look, let's look at the contrast of these two campaigns. Vice -- I'm sorry, Congressman Ryan was down in Florida yesterday talking about Medicare, which is a very important issue, it's a very important cost-of-living issue for millions of seniors across this country. At the same time this week, Vice President Biden was in Virginia talking about people being put back in chains. All right? You take -- you take Governor Romney who is actually talking about coal and how the coal industry is vital for -- for those people in Ohio whose jobs depend on it, but also is part of an above-all energy policy in this country, and also talking about Medicare and also talking about putting people back to work in this country. And at the same time, President Obama is talking to disc jockeys in New Mexico about what his favorite chili is. I mean, this is an election about big things, and this -- this administration is focused on very small things. It's focused on dividing the country. So I think, come November, we're going to be in a better position with the American electorate, because we're talking about the big issues that matter to people every single day. TAPPER: Well, Kevin, one of the points that Stephanie repeatedly makes on the trail when asked about the tone of the Obama campaign is that Mitt Romney is not exactly as pure as Caesar's wife when it comes to attacks on President Obama. Take a look at this video that the Obama campaign put together. ROMNEY: He does not understand in his heart the passion of freedom. I'm not sure which is worse, him listening to Reverend Wright or him -- him saying we must be a less Christian nation. The president has adopted an appeasement strategy. This president spends a lot of time apologizing for America. He should be apologizing to America. TAPPER: And, Kevin, that's some tough rhetoric from Governor Romney. I mean, the offense, the Claude Rains-esque offense that we hear from Boston sometimes these days seems rather insincere, because you guys -- you have some pretty tough hits, too. MADDEN: Well, we're very focused on the big differences in these campaigns. And I think one of the big differences that we refer to in a lot of our campaign events is that essentially we have a -- we have a world view where we believe that the -- we need to put our faith in the American people, we need to put our faith in the entrepreneurs, the risk-takers who help create jobs in this country. And President Obama has a different worldview. His is that we need to put faith in government. And I think if you look at all of those little hits that you've compiled there, that's the big difference. That's the point that -- that Governor Romney is trying to make, which is that we need to have a much more aspirational worldview on our economy, a much more aspirational worldview about how we help individuals succeed in this economy, whereas President Obama feels that the government is the engine of both job creation and the engine for the economy. And that's just a simple difference that we're going to have, and it's one that we're going to litigate before the public, and we feel very strongly that the American public agrees with us. TAPPER: Stephanie, Kevin earlier brought up the questionable comments that -- or the controversial comments, I should say, that Vice President Biden made to an audience with many African-Americans in it, about how they want y'all back in chains. Former Virginia Governor Doug Wilder, a Democrat, called the comments divisive and certainly uncalled for, and this is what former New York City Mayor Rudy Giuliani had to say. GIULIANI: I mean, there's a real fear is, God forbid, he ever had to be entrusted with the presidency whether he really has the mental capacity to handle it. I mean, this guy just isn't bright. TAPPER: I'm sure you disagree with the idea that Vice President Biden isn't bright. TAPPER: But isn't the fact that these remarks are being attacked by both Democrats and Republicans, doesn't that suggest that Vice President Biden to a degree has become something of a liability? CUTTER: Absolutely not. And, you know, on Mr. Giuliani's remarks, I would like to point back to his glowing introduction of Sarah Palin during the 2008 convention. So if he wants to criticize the capacity of a vice president to take hold of this country, he should go back and look at those remarks and whether he still believes that they're true. The vice president is a critical partner to the president of the United States. Joe Biden is out there every single day talking about our vision of where we want to take this country. Now, let's address that remark. You know, I'll say what the president said. They're using that one word as a distraction, but the larger point is an important point. You know, Kevin was talking about believing in free-enterprise system. The president absolutely believes in the free-enterprise system, but we also believe that everybody should play by the same set of rules. And what Mitt Romney has promised is the deregulation of Wall Street, the deregulation of the private sector. We saw how that turned out. Taxpayers ended up having to bail out the private sector because of the reckless behavior. So we don't want to go back there. But that's what Mr. Romney's promising to do. People like Speaker Boehner and even Paul Ryan talk all the time about unshackling the private sector, unshackling the financial industry. So the vice president was playing off of that word. But the central point of what the vice president was saying is absolutely critical in this election: Do we want to have everybody playing by the same set of rules, whether you're on Main Street or Wall Street? Or do we want to unshackle the financial sector and let them do what they did in the last decade and have taxpayers spend billions of dollars bailing them out again? TAPPER: I want to talk about Medicare now, Kevin. Medicare has become a huge issue in the race, and obviously Congressman Paul Ryan was in his battleground state Florida yesterday. Here's a clip from that appearance. RYAN: The president raids $716 billion from the Medicare program to pay for the Obamacare program. Here is what Mitt Romney and I will do: We will end the raid of Medicare. TAPPER: So, Kevin, that is Paul Ryan promising to end the raid of Medicare, but here is one of your most prominent surrogates, former New Hampshire Governor John Sununu, describing the difference between what Ryan has proposed for Medicare and what Romney has. SUNUNU: When Obama gutted Medicare by taking $717 billion out of it, the Romney plan does not do that. The Ryan plan mimics part of the Obama package there. The Romney plan does not. That's a big difference. TAPPER: How can you -- how can you guys be attacking President Obama for cuts to Medicare that Paul Ryan himself proposed, according to your own surrogate, John Sununu? MADDEN: Well, look, starting on Saturday, what you saw was a Romney-Ryan ticket come together with shared values and shared principles about how we would restore those cuts to Medicare and how we would make it more solvent. What President Obama did actually weakens Medicare. It takes $700 billion out of it and uses it to spend on a new entitlement, which is part of Obamacare. So it actually takes the money away from Medicare and spends it in a new way, and that's -- that's the wrong approach. That's actually going to hurt current beneficiaries right now. What Romney-Ryan does is actually restore those cuts, puts it back into Medicare to make it more solvent, because that's what we need to do, and then it actually looks at other ways which we can continue to make Medicare solvent for future generations. And it doesn't affect any of the beneficiaries that are currently in Medicare. So those are very big differences. TAPPER: OK. I only have a couple of minutes left, I want to get both of your thoughts on some independent groups and questions about them. Stephanie, if you could clear something up for me, when pro-Obama super PAC Priorities USA Action introduced an ad that suggested Mitt Romney was responsible in some way for the death of a steelworker's wife, you said, quote, "I don't know the facts about when this individual's wife got sick or the facts about his health insurance," but in actuality you were on a conference call where that steelworker himself told his story. Can you explain why you said you didn't know the facts about the situation? CUTTER: Because I didn't. I didn't know the facts of when Mr. Soptic's got sick, and I only recently learned that through all of the hysteria over that ad. But, Jake, what I do know is what Mr. Soptic's experience was with GST Steel, after Mitt Romney bought it, loaded it up with debt, overleveraged it, paid himself excess profits and fees, but then forced that company into bankruptcy, leaving Mr. Soptic without a job, without health care, and without his pension. And the federal government had to come and bail out those pensions because of Mr. Romney's actions. So clearly, this is a very painful story for Mr. Soptic, and that's the story that I know. And, you know, there are stories like that all over the country because of Mr. Romney's profit-at-any-cost style of business. So that's -- you know, and I've looked at that ad. I don't think that ad blames Mr. Romney for Mr. Soptic's wife death. If it did, it would be unfair. But I don't think that that's what it did. It's talking about what happened when Bain came in, bought GST Steel, overleveraged it, forced it into bankruptcy, and left Mr. Soptic with nothing, Mr. Soptic and all of his colleagues with nothing, while Mr. Romney walked away with a pretty hefty profit. So that's a legitimate discussion to have, and that's a discussion we're going to have all through this election, because Mr. Romney has put his business experience at the center of his rationale for his candidacy. So it's important for people to understand exactly what that business experience would mean. Is that the type of business experience you want in the Oval Office, profit at any cost? Because it comes with real consequences for people's lives. TAPPER: All right, Kevin, one question for you about this new web video circulating from a group called the Special Operations OPSEC Education Fund Group that has some strong Republican ties, no apparent ties to the Romney campaign, but it attacks President Obama very, very harshly for the president's reaction to the Osama bin Laden killing and for national security leaks that have come from the White House or from the Obama administration. Let's take a look. OBAMA: At my direction, I directed -- I directed -- I directed. (UNKNOWN): Mr. President, you did not kill Osama bin Laden. America did. The work that the America military has done killed Osama bin Laden. You did not. (UNKNOWN): So for someone to sit around in a support position and say we killed Osama bin Laden, no, you didn't. You had nothing to do with it. TAPPER: Kevin, very quickly, the Obama campaign calls this a Swift Boat-style attack. Do you? Does the Romney campaign disavow this attack? MADDEN: I haven't actually seen this -- this particular ad. I think it makes an important point, actually, about whether or not some of the national security decisions that the president made were actually helped by some of the policies that were put in place before he was there. But, you know, I think that our campaign is focused on making the arguments about national security leaks, about how that would hurt our national security posture. But that's where our campaign is focused, and those are the kind of arguments that we're going to continue to contrast with the Obama campaign. TAPPER: Kevin and Stephanie, thank you so much for getting up early on a Sunday and sharing your views with us. We appreciate it. When we come back, the nation's finances have the presidential candidates looking everywhere for savings. FALLON: Mitt Romney says he wants to cut funding for PBS. When he heard that, Oscar the Grouch was like, "Seriously? I already live in a garbage can. How much worse can my life get? What is -- you got to be kidding." TAPPER: Can Washington get spending under control? Will taxes have to rise? And if we can't solve the problem, is the U.S. headed toward bankruptcy? We'll ask our all-star panel of experts. Our special discussion is up next. MITT ROMNEY (R), PRESIDENTIAL CANDIDATE: We will cut spending, shrink deficits and put America on track to have a balanced budget. BARACK OBAMA, PRESIDENT OF THE UNITED STATES: They have tried to sell us this trickle-down theory before. It won't create jobs. It won't lower our deficit. It is not a plan to move our economy forward. REP. PAUL RYAN (R-WI), VICE PRESIDENTIAL CANDIDATE: We find ourselves in a nation facing debt, doubt and despair. It is our duty to save the American dream for our children and theirs. JOSEPH BIDEN, VICE PRESIDENT OF THE UNITED STATES: If you want to know what's outrageous, it's their policies and the effect of their policies on middle class Americans. That's what's outrageous. JAKE TAPPER, HOST: And we're back now at the Newseum to discuss the great debate -- can we restore the nation's finances, or is the U.S. headed toward bankruptcy, an issue at the forefront of the presidential debate, especially since Mitt Romney's selection of Congressman Paul Ryan. Thanks to our partners at the Miller Center at the University of Virginia, we have assembled an all star panel of experts. To my right, "Wall Street Journal" columnist Kim Strassal; Senator Pat Toomey of Pennsylvania, who was part of the super committee that tried, but failed, last year, to resolve these budget issues; and Grover Norquist, founder and president of Americans for Tax Reform. 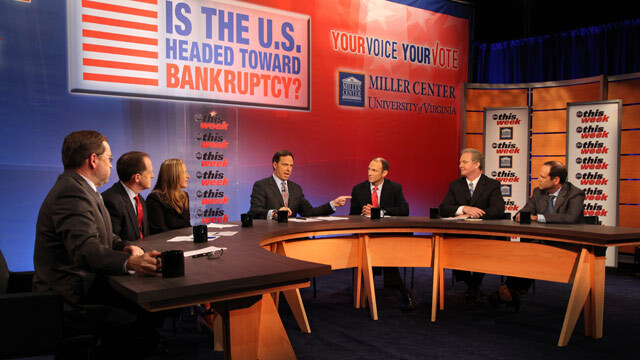 TAPPER: And to my left, Austan Goolsbee, former chair of President Obama's Council of Economic Advisers and University of Chicago professor; Congressman Chris Van Hollen of Maryland, the ranking member of the House Budget Committee and also a former member of the super committee; and Neil Barofsky, the former inspector general of TARP, the Troubled Asset Relief Program and the author of the new book, "Bailout." Welcome to all of you. and also, I should say, welcome to our great audience here at the Knight Studio at The Newseum. You can clap for yourselves. TAPPER: But be -- before we begin our discussion, let's take a quick look at what the stakes are. TAPPER: Do you hear that in the distance? Two ticking time bombs threatening to send the economy back into recession or worse. From Clip: Let's get the job done and let's not play political games. TAPPER: A big if, as we ring in 2013, the ball will also drop on the economy -- huge automatic government spending cuts, $110 billion total. That's like wiping out the economy of both the Dakotas and Montana overnight. Good-bye Mount Rushmore. Simultaneously, tax increases will kick in for everyone -- the Bush income tax cuts, gone. The same with the payroll tax cuts. For a middle class family of four, a tax bill more than $2,000 higher. And that's just the short-term challenge. The long-term picture even worse. And that brings us to the second time bomb. As the baby boomers retire, the commitments we've made to seniors will balloon. Over the next 75 years, Medicare will run a deficit of more than $30 trillion. That's two times the entire size of the United States economy. Social Security will run out of money in just 20 years. In short, if nothing is done, our national debt poses a clear and present danger to the United States. And, yes, politicians have been warning about the nation's debt for decades, but already this year, we've seen economies destroyed by debt -- overseas in Greece, Italy and Spain. And here at home, with Stockton, California; San Bernardino. So the big question -- are we next? is the U.S. headed toward bankruptcy? TAPPER: So with that, let's start with our first topic, which will be entitlement spending, specifically, can we fix the nation's finances without cutting entitlement benefits? That's Social Security, Medicare and Medicaid, other mandatory spending programs. KIMBERLEY STRASSEL, COLUMNIST AND EDITORIAL BOARD MEMBER, "THE WALL STREET JOURNAL": No, we can't. You know, we talk all the time about -- have fights over highway bills and farm bills, all this discretionary spending. Those things that you just mentioned, they are 60 percent of the federal budget. And we are already facing a huge problem. Medicare could go bust in as little as eight or nine years. We're already paying out more for Social Security than we're taking in. And one of the problems here is that what we have to decide is -- is how we are going to rein in the costs. TAPPER: OK, so let's pick one of these entitlement programs. Let's pick Medicare, since there's been so much discussion of Congressman Paul Ryan's Medicare program. Specifically, let's talk about what his proposal would do. First of all, you have the government allocating a fixed amount of money for each senior. And the question, of course, is, will that competition keep costs down or will health care costs continue to outpace inflation? And then the second part of the -- the Ryan plan, seniors will be able to use money for traditional Medicare or for private insurance. And the question, of course, will this leave Medicare with only the seniors private insurers don't want? TAPPER: -- under 55 years old. Right. TOOMEY: -- everybody is currently -- who's currently getting Medicare gets exactly what they're getting now and that doesn't change. But what happens is for someone such as myself, who's 50, when I reach retirement age, I'm going to have a range of choices. And the government isn't going to have a specified dollar amount, it's going to require insurers to compete. And it will set the dollar amount based on that competition, ensuring that I will always be able to receive from the government a premium necessary to buy a plan that's equivalent to current Medicare. So the risk of escalating costs are not carried by the seniors. They're still going to be carried by the government. But we think this is a much better model, because the competition of the various private sector plans, I think, will inevitably discover better and more efficient ways to deliver services, much as some have already discovered this. TAPPER: OK. And Congressman Van Hollen, you are going to be playing Paul Ryan in the debate preparation for Vice President Biden. So I'm sure that you're familiar -- I'm sure you're familiar with his work anyway, but now you're especially familiar with it. REP. CHRIS VAN HOLLEN (D-MD), RANKING MEMBER, HOUSE BUDGET COMMITTEE: That's right. TAPPER: Why do you oppose the Ryan plan? by design, it saves Medicare money by providing seniors with a voucher that declines in value relative to rising health care costs. So health care costs are going up, the value of the voucher does not keep pace. Seniors will have to eat that cost, as opposed to the president's Medicare plan, which says we need to contain costs by changing the incentives in the health care system to reward providers for the quality of care the economy provide rather than the quantity of care they provide. Austin Goolsbee: -- lower health, higher cost patients. And you threaten to blow up the entire program. TAPPER: let me let Neil have a say. Somebody who has a foot in both Washington and outside Washington DC, which strikes you when you hear this debate? BAROFSKY: now's just not the time to start tinkering with and shredding the most important parts of the safety net. I mean, the middle-class is getting pushed into poverty and the idea of contemplating cuts in Medicaid and food stamps, the things that are keeping people alive. I mean, we're on the brink of third-world nation status in some ways. And, you know, now is just not the time for us to be contemplating severe cuts for the people that need the help the most. Grover Norquist: That's what people said about Clinton's welfare reform, they were wrong. Neil Barofsky: We were in a different (inaudible) even, than we were then in Clinton. STRASSEL: I want to go back to what Austan said, though, here because this is really important. STRASSEL: To hospitals, to doctors. Jake Tapper: Yes, doctors are not going to get reimbursed as much, and that's doctors, hospitals, and nurses I think is at the top of the list. Jake Tapper: Hold on one second, go ahead. Austin Goolsbee: Because so many people are getting more insurance. STRASSEL: OK, but there are cuts. Austin Goolsbee: And that's the part I was talking about. STRASSEL: There are cuts to providers, lower payments, which you just said, OK, one of the problems here is when you tell a provider they're going to get less money, guess what they say? We're not going to be in Medicare anymore and they jump out of the system. Who's left in the system? The doctors that are willing to get paid half as much as they were getting. Van Hollen: this is actually going to the heart of the issue. Van Hollen: One of the things we did under Obamacare, was to get rid of the overpayments to the private insurance companies in Medicare advantage. As Austan said, they were paying --- being paid between 114, 118 percent above traditional Medicare. We use some of those savings to reinforce some of the other benefits. Under the Ryan Plan, they adopted all the cuts, but provided none of the benefits. TAPPER: So, the second topic, is taxes, and the question, can we fix the nations finances without raising taxes? Now, I don't know if everyone knows who Grover Norquist is, but he's most famous, perhaps, for his pledge in which he gets those seeking office to pledge that they will, quote, "oppose and vote against tax increases." Recently, some Republicans have started to publicly question the pledge, and in particular, one famous Republican family has started to do so. UNIDENTIFIED MALE: Do you agree with the -- the Grover Norquist pledge? UNIDENTIFIED MALE: You know, OK, so I -- I ran for office three times. The pledge was presented to me three times. I never signed the pledge. I cut taxes every ti -- every year I was governor. I don't believe you outsource your principles and convictions to people. You -- I -- I respect Grover's political involvement. He has every right to do it. But I never signed any pledge. TAPPER: And former -- former Governor Jeb Bush's father had this to say: They) "The rigidity of those pledges is something I don't like. The circumstances change and you can't be wedded to some formula by Grover Norquist. It's -- who the hell is Grover Norquist anyway?" NORQUIST: -- something that both Jeb Bush should have been a little bit aware of, and his father, that commitment that most Republicans who run for office make is to the American people and to the people of their state. When George Herbert Walker Bush ran for president, he promised the American people he wouldn't raise their taxes. He lied to them. He broke his commitment to them and they threw him out of office four years later. He -- he didn't lose the presidency because I was disappointed he raised taxes. NORQUIST: He -- he lied to the American people. TAPPER: -- violating the Norquist pledge? TOOMEY: Yes, let's -- let's be very clear. We are staring in the face the biggest tax increase in American history. TOOMEY: That's right. It will devastate this economy. It will be devastating to our prospects and -- and it will prevent us, really, from solving the other problems that we have. So I'm sitting there thinking, how do we avoid this? Now, if anyone could show me how we can, with certainty they), have the votes and the ability to completely avoid this tax increase, then that's what I'm for. But I haven't been convinced that we've got that completely wrapped up. So I was willing to put a bit of revenue on the table in order to avoid a much, much bigger tax increase. But let me say something that's unequivocal to -- to the question you raised earlier. Absolutely, we can solve this problem without raising taxes. And that's the optimal way to do it. Absolutely, we cannot solve this problem without reforming the entitlement programs. VAN HOLLEN: Well, look, Jake, the -- the fundamental choice the -- the Romney-Ryan ticket makes is to provide another round of big tax brackets to the very wealthy at the expense of everybody else. And it's based on this trickle-down theory. The idea is if you give people like Mitt Romney another tax break, the benefits will bubble -- trickle down and it will lift all the boats. This theory has now been tested by reality. At the end of eight years of the Bush administration, we had actually lost net private sector jobs. The only thing that went up was the deficit. TAPPER: -- first of all, is he -- when he makes the offer of putting revenue on the table, isn't he making the offer to break the pledge? Jake Tapper: It's not just revenue. Jake Tapper: -- tax increases. Jake Tapper: They mean taxes. Jake Tapper: -- we want to raise taxes. Grover Norquist: And they don't want to say -- they don't want to say taxes, so they say revenue. Jake Tapper: OK. So I'm saying it. TAPPER: Is he talking about breaking the pledge? Grover Norquist: the suggestion, what if we raise taxes in return for significant spending cuts? That offer was never on the table from the other side. TAPPER: So, Kim, there -- there was a question during a presidential debate, during one of the Republican primary presidential debates, obviously, which was would you accept $1 in tax increases for $10 in spending cuts? And no -- and every Republican said they would oppose it. TAPPER: -- of what you need to get Democratic votes. STRASSEL: Here's -- here's the political reality. STRASSEL: the only way we're actually going to be able to fix all of these things that we're talking about, OK -- entitlement spending, all of the other problems that we have, the debt that has piled up over the years, is if you get growth. And the way you get growth is with smart tax policy. Van Hollen: -- the reason -- no, the -- the -- the reason for this is Republicans talk about small businesses like you -- you want them to think about mom and pops. They would classify Bain as a small business. Austin Goolsbee: Actually, they would classify Mitt Romney's horse as a small business. Austin Goolsbee: And -- and it -- but it's true. Van Hollen: But it's true. Austin Goolsbee: I know it is. Van Hollen: Fortune 100 companies all come under this rubric of small business. STRASSEL: Small businesses do, too. STRASSEL: No, I want to ask. STRASSEL: Should small businesses be paying higher taxes than GE? Van Hollen: -- at the top a break. Van Hollen: -- of their proposal. Pat Toomey: -- that follows from invalid assumptions that they chose to make. For instance, they simply systematically exclude the reduction in value of certain categories of deductions that Mitt Romney never said was off the table. STRASSEL: They made it up. Pat Toomey: They most certainly do. Austin Goolsbee: -- the amount of money. Neil Barofsky: We're never going to get the deficits under control and the debt under control without eventually raising taxes. The question is, is when are we going to do that. And I agree that we shouldn't do it now. Right now, we're in a terrible, terrible economic situation. But ultimately, like, it's not realistic from a mathematical perspective to think that we're going to stay at these tax rates forever, and somehow the debt's going to magically come down. TAPPER: Our third topic, of course, is defense spending. Can we fix the nation's finances without cutting defense spending at the end of this year, as the New Year's Eve ball drops? Because the super committee could not agree on $1.2 trillion in budget cuts, automatic spending cuts called the sequester will kick in, including $55 billion in defense cuts. I asked Defense Secretary Leon Panetta about this in May. What would this mean for the nation, I asked him? LEON PANETTA, SECRETARY OF DEFENSE: Obviously, Defense has to play a role in trying to be able to achieve fiscal responsibility. The thing that does concern me is the sequester, which involves another $500 billion in defense cuts. PANETTA: These automatic cuts that would take place that I think would be disastrous in terms of our national defense. TAPPER: Congressman Van Hollen, we've seen Democrats -- Sen. Patty Murray, Howard Dean and others, say if we're not -- the Republicans don't come on board with a deal, that's OK. The defense cuts will happen. Doesn't that put the national security of the country at risk? REP. CHRIS VAN HOLLEN (D), MD, RANKING MEMBER, HOUSE BUDGET COMMITTEE; MEMBER, 2011 JOINT SELECT COMMITTEE ON DEFICIT REDUCTION: Well, what the president and Patty Murray have said is we should act right now to avoid it. Look, during the negotiations deciding that, Republicans were given the opportunity to avoid defense cuts by eliminating a lot of special interest tax breaks. They decided to protect special interest tax breaks and put defense on the chopping block. At the end of the day, we hear a lot of talk about defense spending. But once again, not a willingness to pay for it. It's like putting the two wars on our national credit card. TAPPER: Kim, I want to talk to you about these potential defense cuts, because these are not just defense cuts. These are jobs. STRASSEL: Yes. This whole issue has migrated from a fiscal issue to a jobs thing. And I think that this is actually why the president is in a very vulnerable position, because the reality is, if you're Lockheed Martin, if you're Boeing, if you're Pratt & Whitney, you may not know exactly what is coming, because the White House has not specified it yet. But you have a pretty good idea, given the way this sequester was written. It says these things have to be cut equally. Under federal law, these companies actually have to give 60 days of notice out there to any big -- for any big layoffs. So they are right now at this moment putting together 10,000 at a time pink slips to send into the mail, that are going to start hitting in Virginia, in North Carolina, in Florida and New Hampshire in September and October. And I think in the end people are going to say as these notices start coming through, and this jobs argument starts to resonate in the fall, they're going to look to him as the commander in chief and say, why aren't you doing something about this? TAPPER: And, Grover, you'd deviated from the party orthodoxy, the Republican Party orthodox a bit by saying that there is room for defense cuts. NORQUIST: Yes, look, defense spending is not magic. just because it's defense doesn't mean you shouldn't question it and you shouldn't figure out how to spend it more effectively and more efficiently and, yes, there are way to save money and we ought to look at those. Neil Barofsky: I think it's really important to remember how we got here, because sometimes when I listen to the different parties argue it, they like to blame each other for this and for not resolving this. this is something that Republican House voted for, the Democratic controlled Senate voted for and the president voted for. And you know, this is really a symptom of the brokenness in Washington. Neil Barofsky: -- you know, while I agree -- and I hate to sound like a broken record -- we can't have massive spending cuts on defense or otherwise at this point in our economic recovery. And we are going to have to relook at this. We have to do so in a way that doesn't invite this constant can-kicking and this constant cynicism. TAPPER: So Congressman, I just want to be -- I want to hear from you, because you were on the super committee. What happened? VAN HOLLEN: The fundamental problem, in my view, was that our Republican colleagues were unwilling to take the kind of balanced approach required by groups like Simpson-Bowles, the bipartisan groups, that say you need to -- you need to fix this issue by a combination of cutting spending but also raising revenue. Grover Norquist: Taxes. TAPPER: -- before you tell me your version of what happened, would you accept $10 in spending cuts (inaudible) $1 in tax increases for $10 in spending cuts? TOOMEY: I -- it depends on an awful lot of things. If you will agree to actually fix the problem, which is the design of at least one but preferably three of the entitlement programs, then even though we don't think we should have to, and it's not optimal, we'd be willing to put some revenue on the table because it's so important that we fix this problem. TOOMEY: That's what we said. We were united on that. They came back and said, OK. We have a plan. Give us a $1 trillion tax increase, we'll do $1 trillion in spending cuts. None of them structural in the design of the program, on the health care side. It was ratcheting down reimbursement to health care providers. It would not have solved the problem. We certainly weren't going to do that. I put a different framework on the table late in the discussions when we nearly out of time and said, OK. How about we meet you halfway on the revenue side? They thought about it a little bit and said, nah, we need that trillion-dollar tax cut. TAPPER: Speaking of running out of time, we have to take a quick break, but we'll back in just 60 seconds with the answers to the two big questions, is there the political will in Washington to actually get anything done? And if not, is this nation headed for bankruptcy? JIMMY CARTER, FORMER PRESIDENT OF THE UNITED STATES: We must face a time of national austerity, hard choices are necessary. RONALD REAGAN, FORMER PRESIDENT OF THE UNITED STATES For decades, we have piled deficit upon deficit, mortgaging our future and our children's future. To continue this long trend is to guarantee tremendous social, cultural, political and economic upheavals. GEORGE H.W. BUSH, FORMER PRESIDENT OF THE UNITED STATES: Our funds are low. We have a deficit to bring down. We have more will than wallet, but will is what we need. BILL CLINTON, FORMER PRESIDENT OF THE UNITED STATES: If we don't act now, you and I might not even recognize this government 10 years from now. GEORGE W. BUSH, FORMER PRESIDENT OF THE UNITED STATES: Unrestrained government spending is a dangerous road to deficits. So we must take a different path. TAPPER: And as you heard right there, presidents have been warning for decades of the dangers of this country's debt and deficits. So in some senses, this debate we're having today is nothing new. But the big question, is this time different? Is this the year we finally start to get our nation's finances in order? Kim, is there the political will in Washington to get something done this year? And if not, are we headed for bankruptcy? STRASSEL: I don't know if there is with this current president, and you know, with all respect to our two members of Congress here, in the history of Congress, has there ever been an example of Congress coming to ever (ph), make this some gigantic decision without a president leading them along the way and pushing them to do it? And for whatever reason, this is not Barack Obama's style. We have seen the last few years, instead he waits until we're at crisis period; we saw it when the tax cuts were about to expire the first time. We saw it again with the debt ceiling debate last year. And finally, swoops in at the very end, when there's no more time any more. Maybe when we get through this election and this fiscal cliff is upon us, maybe at that point, he will engage and do something. But I don't see anything happening before them. TAPPER: Austan, I suspect that you have a different take. GOOLSBEE: Yes, I don't think that's a particular fair characterization. I think you've seen a lot of hostage-taking by the other side. I would say, yes, I'm somewhat pessimistic before the election or even in the lame duck that Congress will be able to do something. TAPPER: Senator, you were on the super committee, so if any body has the right to be pessimistic, it's you and Congressman Van Hollen. What do you think? TOOMEY: I think we're going to need an election to provide some more clarity from the voters, what I think we're going to need at this point. TAPPER: But if President Obama's reelected, do you think then that means Republicans would say, OK, I'm willing to raise taxes on wealthy Americans? TOOMEY: If Governor Romney is elected, I think we're going to solve these problems. And I think it -- the evidence is pretty clear. We've laid out plans that do it. It's actually simple. All you do is make sure that the government grows more slowly than the economy. That's the answer; there's plenty of will to do it on our side. I think after this election, there will be some more Democrats open to that approach. VAN HOLLEN: Well, I think the most important thing right now is try to -- try to accelerate the very fragile recovery. The president has actually had his jobs initiative sitting before the House of Representatives since last September. Haven't had a single vote on that. So let's get the economy moving again. Let's pass the president's jobs bill and then let's take an immediate but balanced approach to reducing our long-term deficits. VAN HOLLEN: I'm not pessimistic that we can resolve these issues. I believe we have to reach compromise to do it. Right now, at least in the House of Representatives, compromise is a dirty word. And in order for us to solve our problems, there's got to be a little bit of give-and-take. TAPPER: Grover, are you pessimistic, optimistic? Can this problem be solved? NORQUIST: I'm very optimistic, because for the first time one of the parties actually has a plan that will reform entitlements and give us a pro-growth economic policy. And that hasn't been true before. We don't have two parties with that, but we have one. If Romney's elected along with a Republican House and Senate, then you can do something like the Romney and Ryan proposals on tax reform and spending reform and we do a u-turn way from the road to serfdom. There's a decision and people will decide in November, you want bigger government and higher taxes or smaller government and lower taxes? I'm confident the American people will choose wisely. BAROFSKY: No. We're not going to have grand bargain. You can tell from this debate just how highly politicized everything has become. But, no, we're not going to go into bankruptcy, either. The great thing about this country is that notwithstanding the best efforts by both political parties, somehow we blunder our way forward. And we're going to come out of this crisis and we're going to have economic recovery. TAPPER: Reminds me of the quote from Winston Churchill, "You can always count on the Americans to do the right thing after they've exhausted all other possibilities." TAPPER: So thank you very much. That was a terrific discussion. TAPPER: and thanks to our audience here in the Newseum's night studio.